Dr. E. Shyam P Reddy, GCC Distinguished Cancer Scholar, Professor and Co Director, Morehouse School of Medicine, is honored with the globally reputed "Bharat Gaurav Award" and a Certificate of Excellence for Meritorious Services, Outstanding Performance and Remarkable Role from Dr Veerappa Moily, Minister of Law and Justice, Government of India on January 6, 2011, at New Delhi during the India International Friendship Society’s (IIFS) Global Friendship Day. The Society confers the "Bharat Gaurav Award" to luminous personalities in India and abroad, who have made outstanding contributions in their personalized fields, including science & technology, education, politics and social work, services providers industry, etc. Past recipients of this most coveted award include Her Holiness late Mother Teresa, Noble Laureate, Late B.D. Jatti, Former Vice President of India, Dr. Bishma Narain Singh, former Governor, Digmabr Kamat, Chief Minister of Goa, Cricketer Sunil Gavaskar, Veteran Actors Shammi Kapoor, Rajesh Khanna, Dev Anand, Lord Bikhu Parekh, Lord Navnit Dholakia, Mr. Harinder S. Takhar (Minister of the Crown of Province of Ontario, Canada), NRI business-magnate Vijay Mallya, Dr Sampat Shivangi, Dr Bhagwan T. Sahni, Dr Sudhir Shrivastava, Dinu Patel, Dr Jayanti Singh, Dr A. Ganguli (All from USA), Omie Singh (Member of Parliament) (South Africa), Abdul R. Rumane (Kuwait), P. D. Patel (Dubai), Sukh Daliwal Member of Parliament Canada, Vancoover etc. The award was presented jointly by Mr Pawan Kumar Bansal, Minister of Parliamentary Affairs & Water Resources Government of India with Former Union Minister & Governor Tamilnadu, Dr. Bhishma Narain Singh, on the occasion of National Seminar on “Global Participation in India’s Economic Development” held on 6th January 2011 at Hotel Meridien, New Delhi to mark the Parvasi Bharatiya Divas for the year 2011. Other dignitaries that were present in the award giving ceremony include Hon'ble Baroness Sandeep Verma (second from right), Minister in waiting Govt. of UK, Ms Ruby Dhalla (first from right), Member of Parliament from Canada , Mr.Rohit Kochhar (Chairman & Managing Director Kochhar & Co.) and Gurmeet Singh, Secretary General, India International Friendship Society. 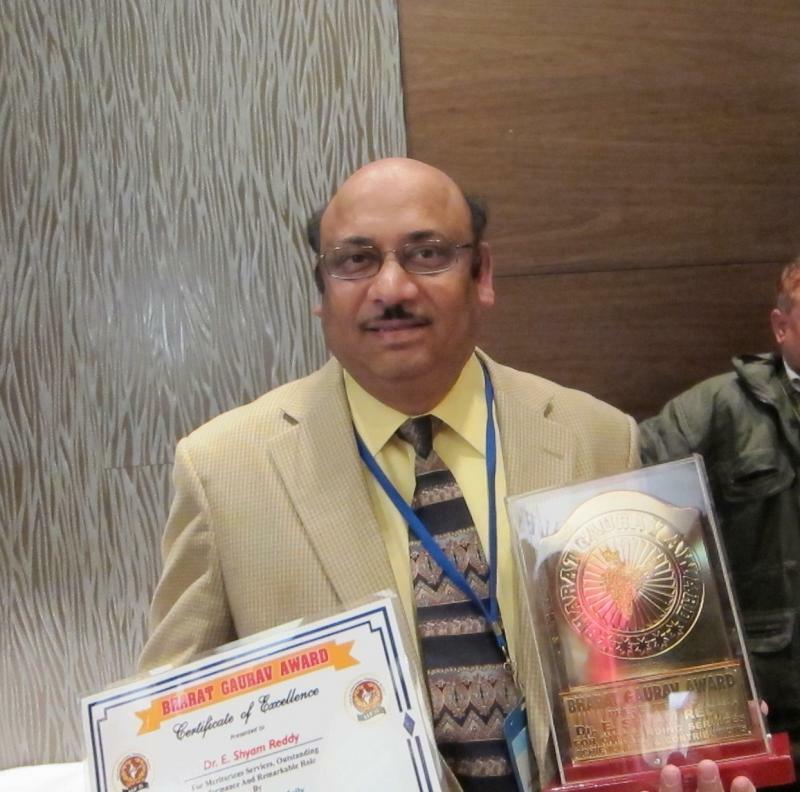 Dr Reddy received Bharat Gaurav Award and a Certificate of Excellence on Jan 6th 2011 at New Delhi, India.